It helps generate new business leads. Referrals and testimonials from other people on social media can be VERY powerful for new business generation! Social media can greatly help improve your company’s visibility to search engines. Learn from people’s comments/feedback (both positive and negative) about your business and take that into consideration when developing new products, services, content, your expansions, partnerships, etc. Direct feedback is so valuable! Push people towards your website – by linking to informative articles posted on your website, products that you sell online, offer special promotions, etc. Media are always looking for new story ideas and expert sources online – be sure to use the right hashtags that will make you easy to find! 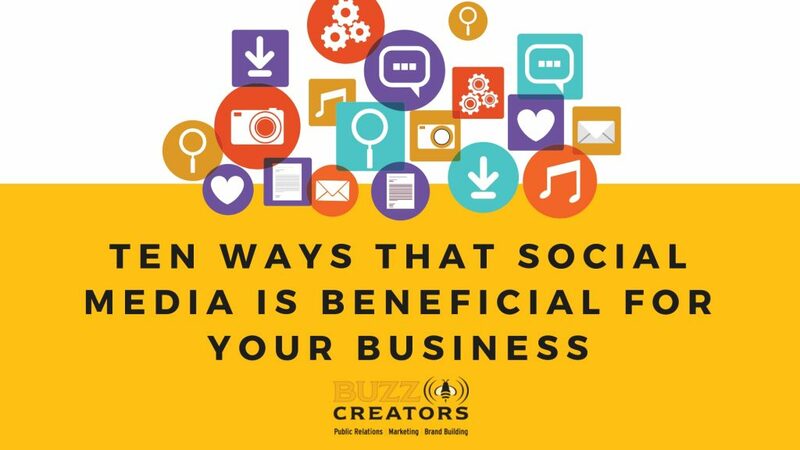 Buzz Creators, Inc. is a Westchester, NY-based boutique public relations and marketing firm servicing the metro NY area and beyond. At Buzz Creators, we believe that every business has its own unique and special story. Our goal is to help clients tell theirs. Buzz Creators assists its clients with developing strategic PR campaigns; media relations; social media; writing and editing; grand openings and special events; thought leadership; advertising; graphics design/branding and more. The Buzz Creators team has helped develop strategic communications programs for many well-respected national and global organizations, such as Barnes & Noble, MasterCard Worldwide, HEINEKEN USA, Leukemia and Lymphoma Society, American Heart Association and UBS Financial Services, in addition to leveraging their PR, social media and marketing expertise to help many regional small businesses increase their presence in the marketplace. For more information about Buzz Creators, please visit: www.buzz-creators.com.